Jessops plc has today moved to reassure customers that the firm's expected 'voluntary liquidation' will have no impact on its high street shops. Jessops plc has today moved to reassure customers that the firm’s expected ‘voluntary liquidation’ will have no impact on its high street shops. Next week Jessops plc shareholders will meet at an Extraordinary General Meeting where they will vote on a members’ voluntary liquidation ahead of the company being de-listed from the London Stock Exchange. A Jessops spokesman confirmed that this is a formality as the public limited company prepares to de-list as part of the financial restructuring plan announced last year. Trading in Jessops shares will be suspended at 7.30am on 20 January. If shareholders approve the board’s proposal, the de-listing will take place at 8am on 22 January. ‘Under the restructuring [announced] in the autumn, the trading assets – i.e. 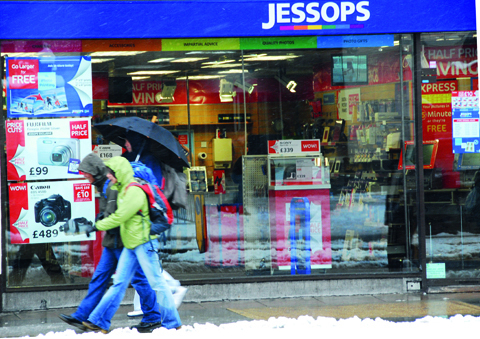 the shops, stock etc – were transferred to new ownership,’ explained a Jessops spokesman. The financial restructure aimed to save 2,000 jobs and meant that HSBC forgave £34m of debt owed by Jessops. As part of the restructuring deal, Jessops – which was saddled with £57m of debt – said that £100,000 will be made available for distribution to Jessops shareholders. Jessops floated on the stock market in 2004 and continued on an expansion path that increased its store portfolio to more than 300.